Sat., Feb. 24, 2018, 9:48 a.m.
ROME – Italians demonstrated Saturday against racism, revivals of fascism, labor reforms, mandatory vaccines and other hotly-debated issues, at some points clashing with police, as antagonism flared between far-left and far-right activists in a violence-marred election campaign. It was the last weekend for political rallies ahead of Italy’s March 4 national election, and protesters held at least a dozen marches or rallies in several Italian cities. 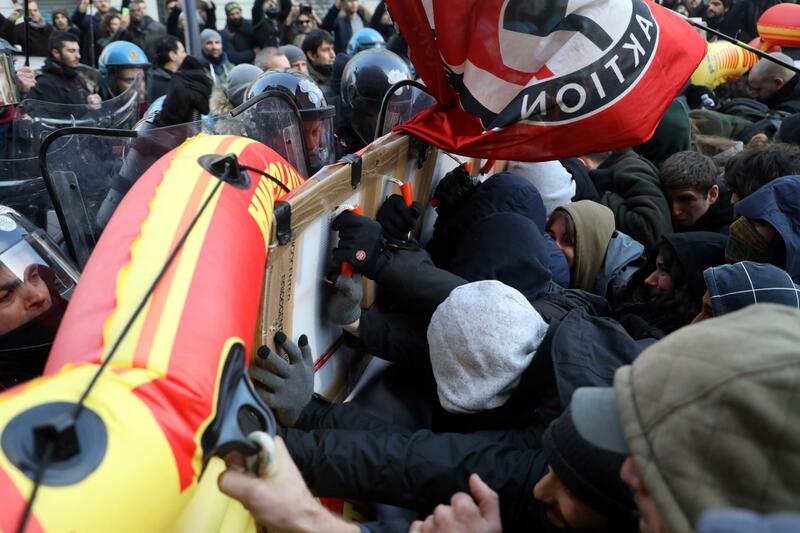 In Milan, far-left demonstrators clashed with police trying to block them from reaching a far-right rally. Police in riot gear wielded batons against the front line of protesters to drive them back. In Rome, a march drawing Premier Paolo Gentiloni and other ministers in his center-left government, deplored racism and revival of fascist ideology. Across town, another march protested government labor changes that made it easier to lay off workers. “And also dangerous is the underestimation of this phenomenon,” he added. Still elsewhere in the Italian capital, protesters denounced the government’s decision to make several vaccines mandatory for schoolchildren, another issue inflaming campaign debate. Campaigning officially ends on March 2. Opinion polls indicate a hung Parliament could result, with three blocs, each short of an absolute majority: the center-left, the center-right and the populist 5-Star Movement. Italy’s election campaign took a violent turn on Feb. 3, when an Italian man in the central town of Macerata opened fire on African migrants, wounding six of them. The suspect, who once ran in a local election for the anti-migrant League party, has said he was avenging the death of an Italian woman allegedly murdered by African migrants. In Milan on Saturday, League leader and premier candidate, Matteo Salvini, denied that his followers advocate violence. Instead he denounced what he called “this angry anti-fascism” and declared fascism a dead ideology. The Italian constitution bans revival of fascism, the ideology of dictator Benito Mussolini before and during World War II. Opinion polls indicate many Italians blame migrants for crime. The League, along with the 5-Star Movement, contends that foreigners, by working for less pay, rob Italians of work. In Rome, police stopped chartered buses bringing demonstrators to the city, opening participants’ backpacks and searching vehicles to ensure that clubs or other weapons weren’t hidden. Three Milan subway stations were closed as a precaution near Salvini’s rally, near a rally by the far-right CasaPound group and near an anti-fascist gathering. A few blocks away from Rome’s anti-racism march, thousands of unemployed people from the south, metal workers, far-left youth social clubs and advocates for public housing marched to protest the government’s labor reforms. Tensions were high in Palermo, Sicily, where days earlier the local leader of the far-right Forza Nuova party was beaten up on a street. Some shops closed early Saturday, fearing participants in an anti-fascist march would clash with those attending a Forza Nuova rally but the anti-fascist march proceeded peacefully. Forza Nuova national leader Roberto Fiore, leading a campaign rally in Trieste, northeast Italy, blamed “this campaign of hatred” on far-left forces. Fiore rejects the label of neo-fascist, saying instead he is fascist. In Florence, a 17-year-old boy was fined when police noticed him ripping off campaign posters on the right-wing candidate for premier, Giorgia Meloni. Just days ago, two youths were slashed when they were affixing posters for a tiny, far-left party. Published: Feb. 24, 2018, 9:48 a.m.